Even if you’ve somehow managed to make it through your life never having seen a cat in person, chances are good you’ll know – at the bare minimum – two things about cats from even having watched a few videos of them online: cats meow, and cats purr. Those of us who house the remarkable felines in our own homes know just how lovely it feels to hear or pet a cat that’s purring. When we pick up our pet and he or she purrs, we feel loved, appreciated, wanted. Why is this? A huge part is that a cat’s purrs make us feel like that cat is happy. But are cats happy each and every time they purr? Do Cats Purr Because They’re Happy? Yes. Cats purr because they’re happy. But – and this is a big but, the story doesn’t end there. The “cats purr because they’re happy” statement can be misleading because it’s really only the start of the story. The rest of the story? 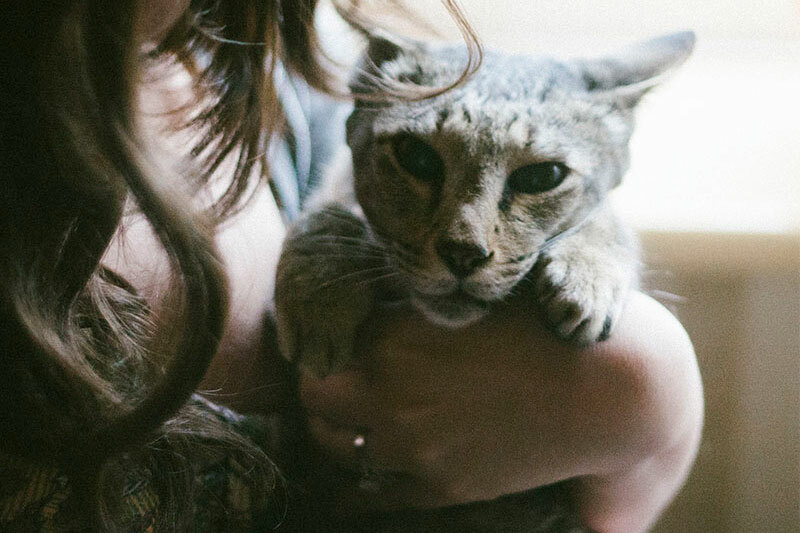 While we don’t know exactly why cats purr, we do know that they purr for many different reasons and to express many emotions, not just happiness – though happiness is certainly a big part of the equation. Wrapping your head around this idea is a little tricky, but it’s a lot easier if you approach the idea the right way. I’ve been reading The Domestic Cat: The Biology of Its Behaviour by Dennis C. Turner, and in the book, Turner suggests what I believe is the perfect way of thinking about a cat’s purr: think about a cats purr as though it’s a smile. Why would this help you make sense of cat purring? Well let’s break it down. Humans smile because they’re happy. You’d definitely agree that this statement is very true. But is it the whole story? Are human smiles as simple as that? No, they’re not; which you most certainly know. Why? Well a human smile doesn’t always represent happiness. Usually, yes, but all the time: no. A smile on a human being represents other emotions and sentiments sometimes. The list goes on and on. Is it common for humans to smile for reasons other than happiness? Not as common as it is for humans to smile to show they’re happy, but yes, it does happen. 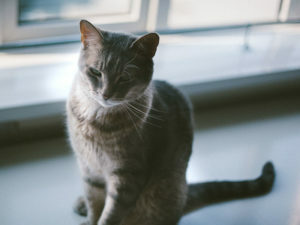 Similarly, cats purr mostly because they’re happy, but sometimes also purr for other reasons – including communicating emotions and messages besides “I’m happy” to other cats and even humans. Okay so let’s break it down..
1. Cats often do purr to communicate they’re happy. Obviously this had to be #1 on the list, no way you’re surprised about this. 2. Cats sometimes purr to communicate they’re hungry. Cats will often combine a unique purr with a unique meow to let you know they’re aware dinnertime’s coming – and their tummies are ready for a meal! These cute purrs mixed with some vocalized begging make perfect sense – I mean what human hasn’t been suckered in (at least a few times) to giving dinner a bit early for a cat who’s put on an adorable show like that? 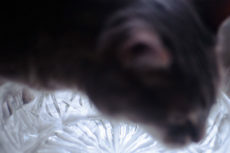 As stated, these purrs and meows are unique – different form a cat’s regular purrs and meows. 3. 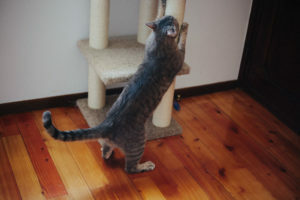 Cats sometimes purr to communicate they want something. 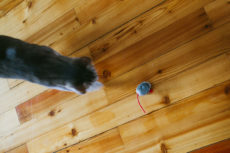 In same way a cat will purr to communicate it’s hungry and wants some food using a unique purr + unique meow combination, a cat will sometimes use the very same trick to communicate it wants something else. Dr. Joanne Righetti points out this purring is called a ‘solicitation purr,’ and that it leads humans react in the same way a human parent would respond to a human baby. Sounds completely on point to me. 4. 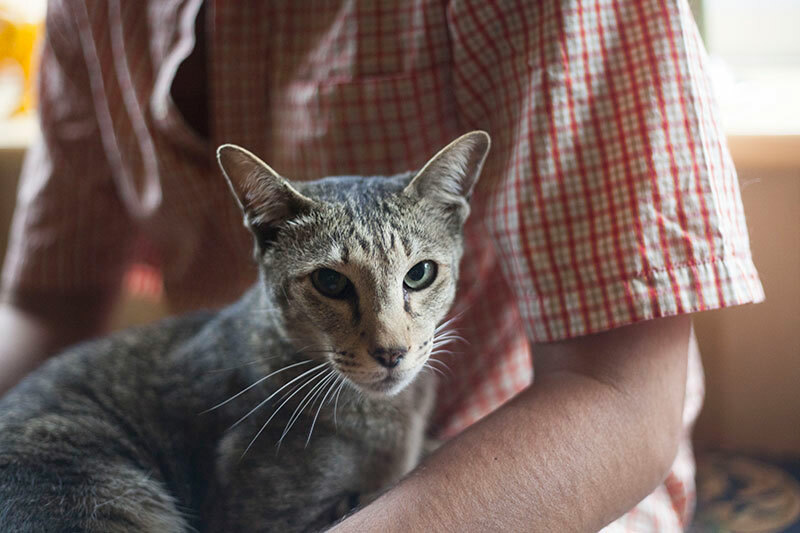 If hurt or injured, cats purr to help heal themselves. This one is 100% true – it’s not at all a myth, though it may sound like one. Cats do purr to heal themselves – which is incredibly impressive! Yet again, very impressive kitties! Killer biology if you ask me! 5. Injured cats may also be purring to soothe themselves. It’s often said that hurt or injured cats might be trying to soothe themselves with their purring, and while science suggests that’s not the only reason cats purr while hurt (again, because purring seems to help them physically heal themselves), it doesn’t mean we can rule this soothing business out completely. It’s possible that cats purr when hurt for both reasons – to heal themselves and to soothe themselves! 6. Cats may also use purring to soothe themselves when stressed. If this whole soothing business turns out to be spot on, and cats do sometimes purr to soothe themselves, they may not just do it when injured – they may also do it when they’re stressed! 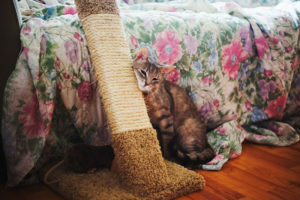 This makes it a little difficult to say why a cat is purring, as he or she may be doing it out of pure elation and happiness, or because he or she is stressed and is trying to soothe him or herself to be more at ease. Definitely be sure to pay attention to what happened before the purring started, and to what surrounds the cat to discover whether it’s possible the cat is stressed rather than happy. 7. Cats may use purring to sooth themselves when sick. Not fun being sick, and certainly is a little stressful. 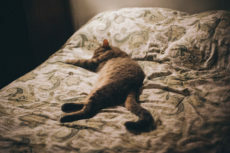 If your cat is purring when it’s sick, it may not be because it’s particularly happy – just stressed and/or tired and trying to put itself at ease and rest up. 8. Kittens a few days old first purr while suckling, which may be to communicate to their mother they are okay. A very cool fact I got from The Domestic Cat: The Biology of Its Behaviour. Kittens purring while suckling? What a great way to communicate to mom that you’re doing alright and are happy, relaxed, and growing well. 9. Kittens may continue to use purring to help them create a close relationship with their mothers. Yet another very cool fact pulled out of The Domestic Cat: looks like we may not be the only species that’s completely enamoured by the purring of a teeny tiny cat. Purring from a kitten may also be what helps a kitty’s parent cat to feel close to her baby, sort of like when a human child smiles at his/her mother and their mother melts from pure happiness. All this to say, kitten purring may be a way for that kitten to establish a closer relationship with his or her mum. 10. 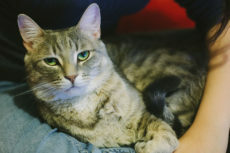 Adult cats likely continue to use purring to create close relationships with other cats and kittens. 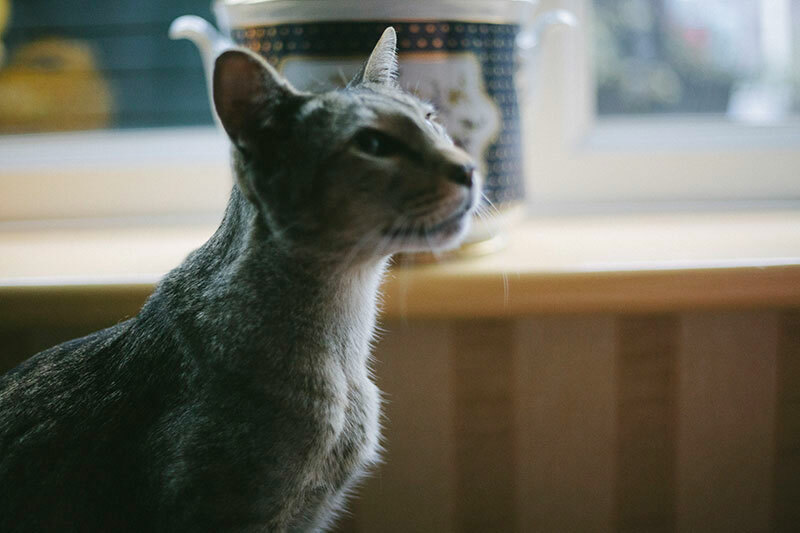 Just like a smile, adult cats will continue to purr throughout their lives during times you’d expect them to be bonding with other cats and kittens around them. “The purr is used by adults in social and sexual contexts. For instance, an adult female will purr while suckling her kittens and when she courts a male.” (The Domestic Cat, page 195). 11. If cats purr to create closer bonds with other cats, they could be purring around humans to create closer bonds with them, too. I’m jumping the gun a little here since I haven’t seen any vets say this per say (if you find a vet who has said something similar, let me know so I can add them as a reference), but if cats use purring to create close bonds with other cats, it makes sense that they purr around humans to do the same thing – create close bonds with the humans in their lives. After all, it’s in their biology, just like smiling is in ours. Humans smile a lot at each other when they’re making or in the company of friends. Sometimes humans will smile on purpose because they’re trying to make an effort to show they’re friendly, and other times, they’ll smile purely as a reaction to spending time with the friend making them happy. This tightens the bonds of friendship amongst humans. Maybe cats purrs work exactly the same way. 12. Adult cats can use purring to communicate they mean no harm to another cat. Yet again, this very cool fact I pulled out of the book, The Domestic Cat. In cases where two adult cats meet, the cat that is subservient (i.e. not dominant) will sometimes use purring to show the dominant cat that it means no harm. Essentially, purring would be used to smooth things over the same way a human might smile at someone to signal they’re not there to pick a fight and have no ill will toward the other person. *Bonus: Remember that purring heals cats? It may physically help humans, too. Now I’m not trying to mislead you into thinking that a cat purring on your lap is physically helping you build muscle and repair tendons like cats are able to do for themselves with purring. No – cats don’t have the magical ability to heal humans quite like that. But cats do have a positive impact on our health, and this is not just something we feel as pet owners: science backs up our sentiments. 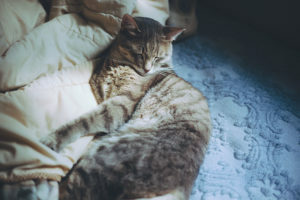 Somehow, there seems to be a connection with a cat’s purring and this positive impact, though it’s not yet proven for certain. Cats lower blood pressure and stress in their owners. And more than other animals – which might suggest that it’s partly down to their purring. Isn’t that cool?? Your Thoughts on Cat Purrs? 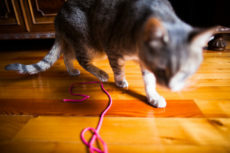 I’m sure you didn’t come into this article blind – chances are really high you already guessed one or even all of these reasons cats purr before you read the article. Why did you think cats purred? Did you learn anything from this list? Find out anything new? Did any reason on this list surprise you? Did I leave anything off that should’ve been included? Oh and, aren’t you proud of the fact that your cat may be helping to extend your life, possibly a huge part thanks to his/her purrs? I know I am! I would strongly advise never to let them out to wander by themselves. It’s like letting two or three year old child out unsupervised. We walk our cat with a leash. Let him lead/go most places he wants (most places, but not all! Lol !) THERE ARE JUST TOO MANY DANGERS OUT THERE !!! I have long been an advocate to keeping your cats indoors they live twice as long as they’re healthier they’re happier and they don’t kill the birds and rabbits outside I think it’s cruel to leave an animal outside. I’ve had three cats in my lifetime one live to be 15 one lived to be 19 and one live to be 20 that wouldn’t happen if they would have been outside cats the 15 year old got liver disease otherwise I’m sure he would have lasted another five years himself. The 20-year old was a cerebellum cat she couldn’t walk but had a long happy life. Loved the article! My indoor 12 yr old cat escaped to the great outdoors one day. I was convinced that if he heard or saw me he’d come running to me but that wasn’t true. After hours of searching I spotted him hiding in a bush. It was strange, he was growling & wouldn’t come to me so afraid I’d spook him, I sat down about 5 ft away and talked to him. As he slowly crept towards me, I could hear him growling and purring at the same time, which he continued to do for over 1/2 hr. My husband humorously wondered if he was glad to see me but mad that it took so long. They are complex creatures! Can’t imagine life without them! 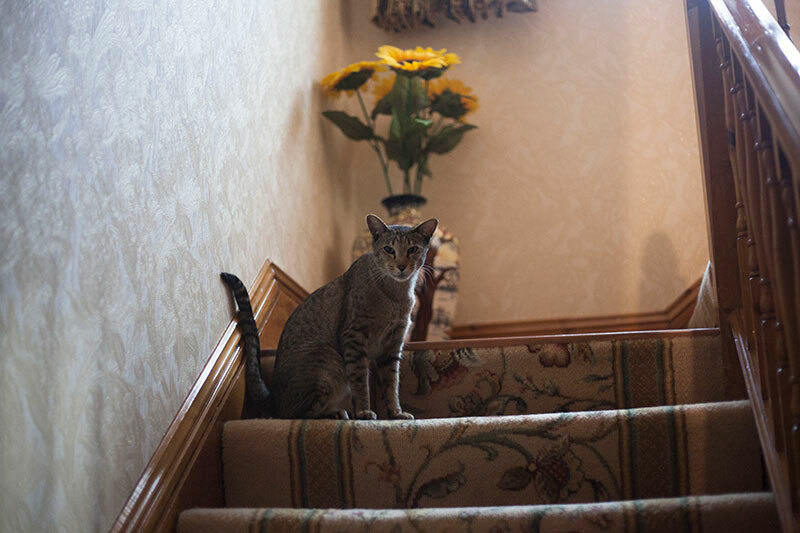 We almost lost Avery on a few occasions, so the bit you were talking about where you said you thought you could simply call and he’d come back – but that your cat growled and wouldn’t come near you while outside – it’s almost exactly how I feel Avery would be. On the occasions we nearly lost Avery he looked scared into our eyes and acted as though he didn’t even know us. First time, we successfully lured him back with food, second time, he escaped from a leash, Thomas successfully distracted him and I managed to pick him up, luckily. It’s almost as though some house cats turn feral as soon as they step out your front door! That’s a perfect example of a cat who’s obviously not happy purring because he’s distressed. Or maybe your husband was right – you never really know! They sure are complex creatures, a lot more complex than I think we normally give them credit for. Wish they’d been researched more so we could get a better grasp of their behavioural quirks, though I definitely can’t live without them either at this point! 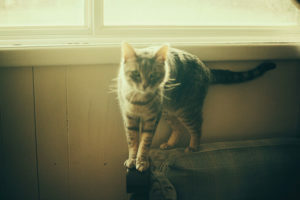 This was such a refreshing article to read when it comes to cats psychology and emotions. Who can then say that cats are vicious? They are loving and caring beautiful beings full of love which even radiates from them in a form of a vibration! They are like a small loving and caring angels who if treated right will share their beauty with you. Sometimes when I am dead tired and exhausted and nothing can make me feel better, my cats can. Their purrs are magical and when you hug them and feel their purr in your hands and chest, you know that they are doing their best to make you feel better. Great post, thanks fur sharing! Purring can be purrfectly wonderful on so many fronts!